I would just like to clarify that I am definitely not advocating that GPs deceive patients or use dummy placebo pills. Rather I am suggesting that GPs remember that in clinical trials a very large part of the effect of anti-depressant drugs is in fact placebo. In other words much of the benefit that mildly depressed patients can get from visiting a GP is psychological. This often comes by the GP providing a ray of hope to pierce the gloom, whether this comes from drugs, a positive discussion, referral to CBT or provision of information. I'm glad to hear this, Stuart. I agree it is important for the doctor to provide hope and encouragement - as long as this is realistic. It would be ridiculous if doctors were just giving out sugar pills to treat depression. And the pharmaceutical companies would then be out of business (although they shouldn't exploit the placebo effect of antidepressants). However, you now seem to be saying the opposite of what you wrote in the article. Patients should care whether taking an antidepressant is merely a placebo effect. You said they don't. 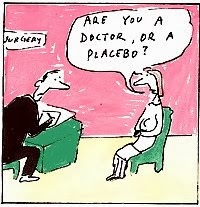 Do you think antidepressants are merely placebos? Certainly, even in the clinical trials, a good proportion of patients are not helped and the difference between taking antidepressant and placebo is small. The clinical significance can be questioned because the effect size is so small. I can't prove that the small difference is due to placebo amplification because trials are not really double blind, but I'm inclined to think this is the case. In other words, I think it is a serious question, which people don't want to face, whether antidepressants are merely placebos. If I could prove it, I wouldn't use them. And there are dangers of relying on a placebo effect, because it means people can get dependent on medication, leading to discontinuation problems when withdrawn. So, I'm sorry if I was unnecessarily harsh on the way you expressed your emphasis on the importance of hope and encouragement in the treatment of depression. Maybe we can agree about what patients should be told about antidepressants.